This is a brilliant exhibition by Dale Frank, one of my favourites so far this year in Melbourne. 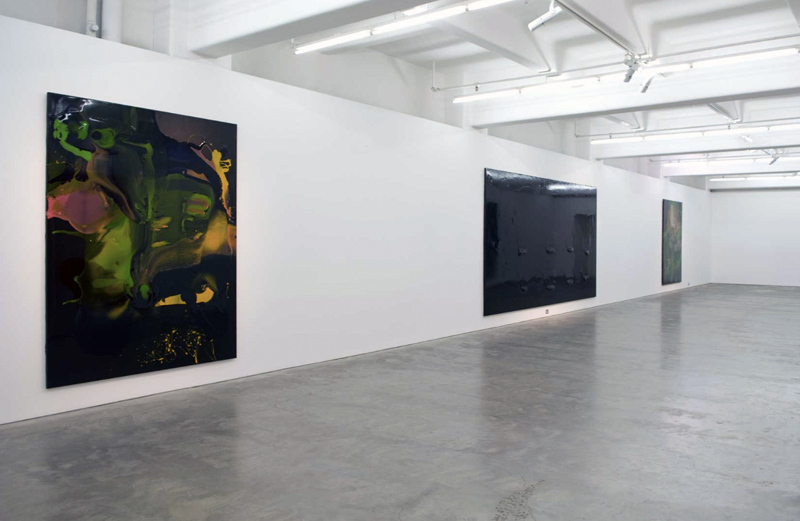 Six large varnish on linen landscape paintings are presented in the beautiful Anna Schwartz gallery space in Melbourne. Photographs really do not do the paintings justice – they can only give an impression of the size and scale of the work but not of their intimacy or smell. The smell of varnish permeates the air. The serendipity of the natural convulsions of the varnish and the facilitations of the hand of the artist, his performance, have been caught like bugs in amber in the final molecular structure of the painting. 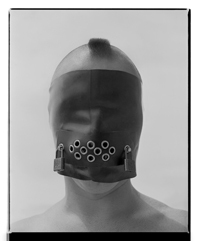 Here are pendulous, globular goops of varnish, immersive heroic tone poems that form images in the mind of the viewer. Moving close to the paintings you are surrounded by flows and eddies, the macro and the micro; details become more apparent as you study the work. While disagreeing that these paintings are the viewers to create (the viewer as author) what I can say is that the artist offers the viewer the ability to generate their own resonances with the painting, to use the imagination of ‘equivalence’ to suggest what these paintings stand for – and also what else they stand for. States of being, of transformation, wonder and joy emerge in the playfulness of these works. Perhaps this is where the titles of the paintings come from, referencing film actors in the pop tradition, but this is the only thing that did not ring true with the work, their titles. The use of this trope seems to me a bit facile given the nature of the work. The hot pink painting Rupert Grint (2008/2009, above) is hotter and lighter than in the photograph above, the varnish more translucent, the effect altogether mesmeric. You are drawn into the work, the intensity of the colour, the thickness of the hanging varnish. 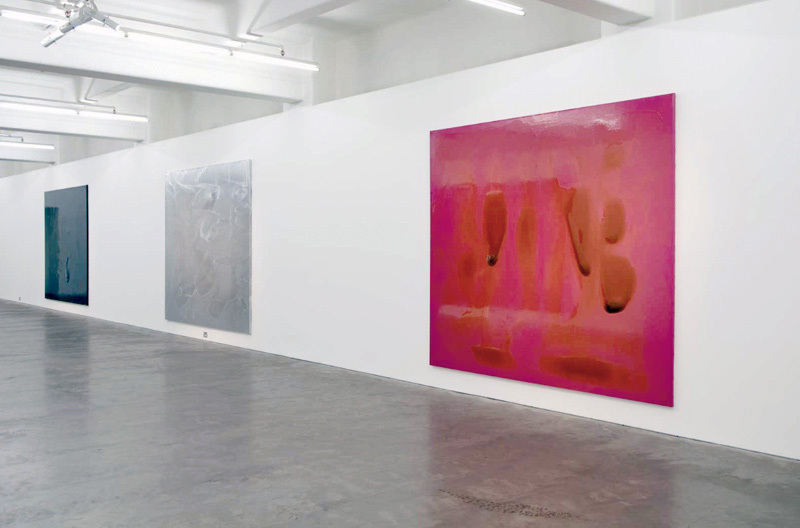 Two cosmological galaxies (Timothy Oliphant (2008) and Matthew Macfadyen (2008)) surround the most complex painting in the exhibition, the darkness and light that is Ryan Gosling (2008/2009, below). This painting is a tour de force. With the poetic structure of an oil spill, the varnish forms intricate slick upon slick contours that are almost topographical in their mapping. 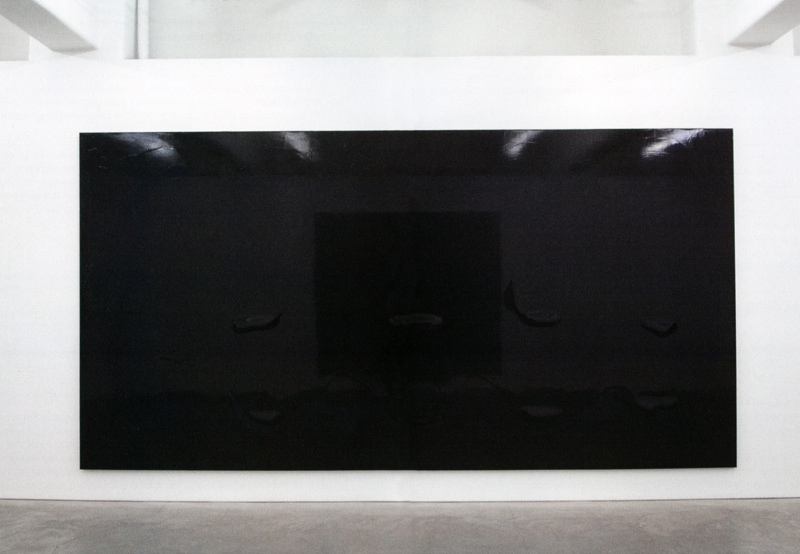 The black oozes light, becomes ‘plastic’ black before your eyes, like the black of Rembrandt’s backgrounds, illusive, illuminative and hard to pin down – perpetually hanging there in two dripping rows, fixed but fluid at one and the same time (you can just see the suspensions in the photograph above). 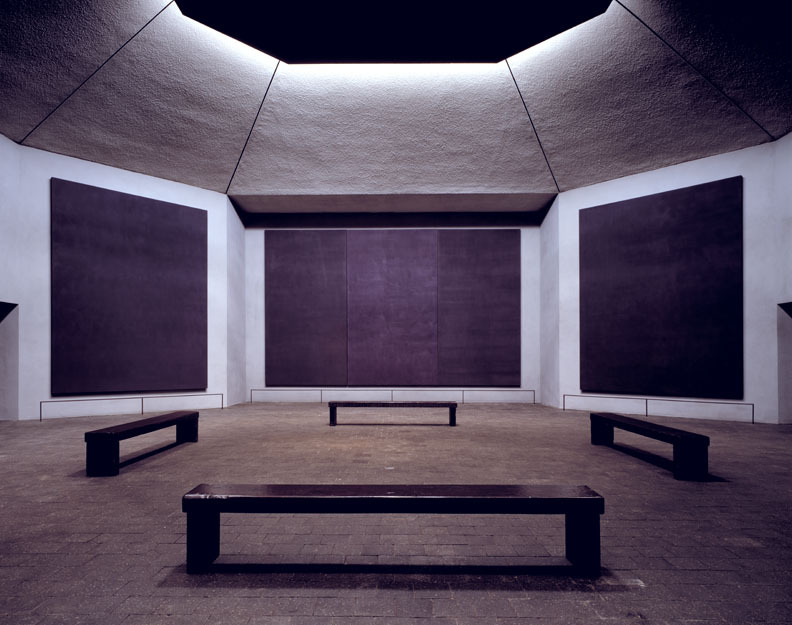 The painting reminds me of the black paintings of Mark Rothko that he undertook for The Rothko Chapel in Houston, Texas (see below). As with the Rothko paintings, this painting is not just black (physically there are swirls of purple as in the Rothko paintings), not about darkness at all. What both artists do is create a contemplative, transformative space – in Frank’s case for a world on the edge of oblivion. This is a post post-modern landscape: process and nature, performance and chance coalescing in the colour : black! This painting is one of the most overwhelming syntheses of art and nature, of universal forces that I have seen in recent contemporary art. This exhibition is an electric pulsating universe of life, landscape and transformation. Magnificent! “The immersive scale of these new paintings at Anna Schwartz Gallery Melbourne allows us to experience their inner qualities of landscape and of transformation. This is painting at fundamental authenticity. The paint is its own agent; it is allowed to act, to behave. The artist is the facilitator of these phenomena of nature and natural forces, whose residue is a metaphor for nature itself. Black contains all colours, contours and depths. A pink monochrome is transformed by pure varnish into an expressionistic moment of process and performance. All colour is absent from elemental silver aluminium and form and gesture alone survive. New dynamics are possible through an innovative colouration: the emergence of colour through black, and its equivalent power. Anonymous text from the exhibition flyer.